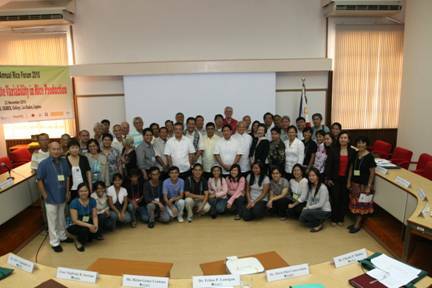 In 2010, the Annual Rice Forum was organized under the title of Adaptation to Climate Variability in Rice Production. It was held on 23 November 2010 at Drilon Hall, SEARCA, College, Laguna. Climate variability affects crop growth and development and determines yield. Extreme climate variability such as droughts, floods, typhoons, etc., reduces crop yields and causes significant yield losses. Seasonal climate can now be predicted three to six months in advance with reasonable reliability which can allow early decision making as regards scheduling of farm activities. Climate-related farm decisions can reduce risks and other expected losses. While there is a range of possible knowledge-based adaptations that can be implemented to enhance climate resilience of crop production systems, adaptation measures are appropriate only at particular levels. There is a need to document these science-based adaptations and applications in order to draw lessons from, and develop guidelines for, replicating in other sites and for up-scaling in other areas. 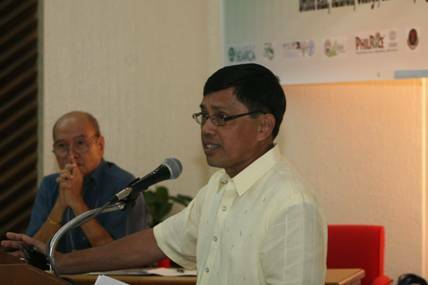 The ARF Annual Rice Forum 2010 was organized in cooperation with Southeast Asian Regional Center for Graduate Study and Research in Agriculture (SEARCA), International Rice Research Institute (IRRI), Department of Agriculture-Food and Agriculture Organization Philippines-Strengthening the Philippine Institutional Capacity to Climate Change (DA-FAOPH-SPICACC), Philippine Rice Research Institute (PhilRice), University of the Philippines Los Baños (UPLB), Philippine Council for Agriculture, Forestry and Natural Resources Research and Development (PCARRD), International Service for the Acquisition of Agri-biotech Applications (ISAAA), Provincial Government of Albay (PGA), National Academy of Science and Technology (NAST Philippines), and AGHAM Partylist. Community-based Initiatives on Increasing Adaptive Capacity of Smallholders for more Climate-resilient Rice Production Systems, by Ms. Maria Pilar S. Castro-Pablo and Dr. Charito P. Medina, from Sibol ng Agham at Teknolohiya (SIBAT) and Magsasaka at Siyentipiko para sa Pag-unlad ng Agrikultura (MASIPAG), respectively. In addition, there was a panel discussion on "Community-based Climate Change Adaptation Strategies" with Dr. Feliciano G. Calora, Jr., Dr. Arnulfo M. Mascariñas, Rev. Fr. Francis B. Lucas, Ms. Mae Joy C. Armada, and Dr. Frisco M. Malabanan as discussants, followed by an Open Forum. The publication of the proceedings of the Forum is on-going. Dr. Felino P. Lansigan presenting his paper.